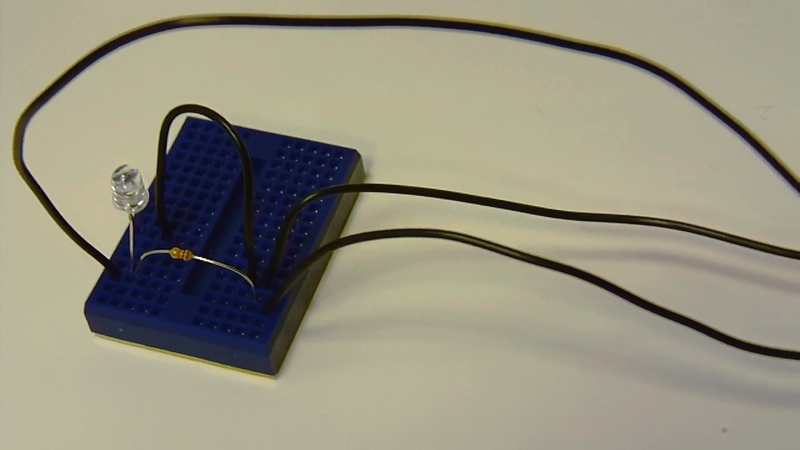 This example implements a new .NET Gadgeteer module from an Infrared Phototransistor and a 10 kilo ohm pull-up resistor. It uses the GHI Electronics Extender Module to connect the simple hardware. The output activates binary logic on a general-purpose digital input/output pin, operating at 3.3 volts. This case is not difficult to understand. Many other binary operations can be done the same way. 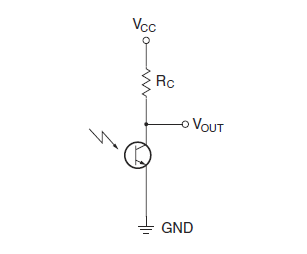 The following schematic shows the phototransistor circuit. The voltage, V out, transitions from the low state to the high state when light is detected. 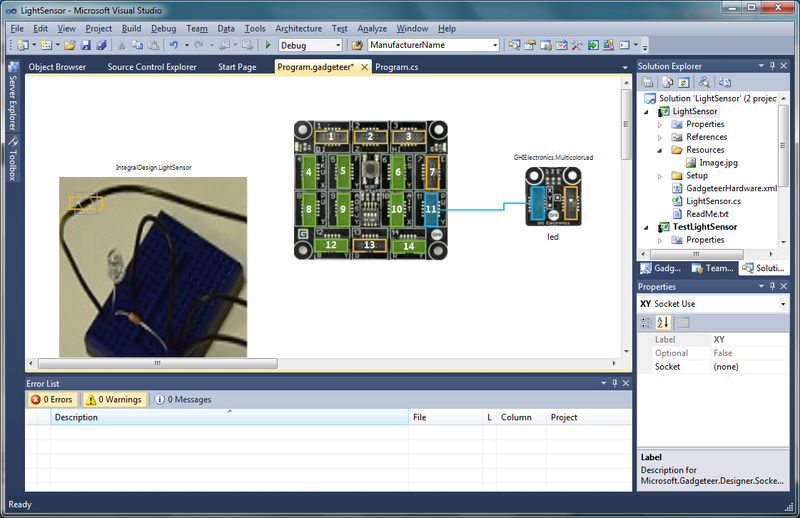 The following video demonstrates the operation of the light sensor module in a .NET Gadgeteer application with the GHI Electronics Fez Spider Mainboard and a Multicolor LED. When the sensor is exposed to light it raises an event that is handled by C# application code and starts the MulticolorLED blinking. This event could be used to activate other modules such as a camera module or an alarm. The .NET Gadgeteer Builder Guides contain an important reference when you are creating new modules. The Socket Types Table identifies the functionality each socket and pin supports. Modules, such as this light sensor, that only require a general-purpose digital input/output pin, operating at 3.3 volts, can be implemented on an X or Y type socket. An X type socket supports general-purpose digital input/output (GPIO) on pins 3, 4, or 5. 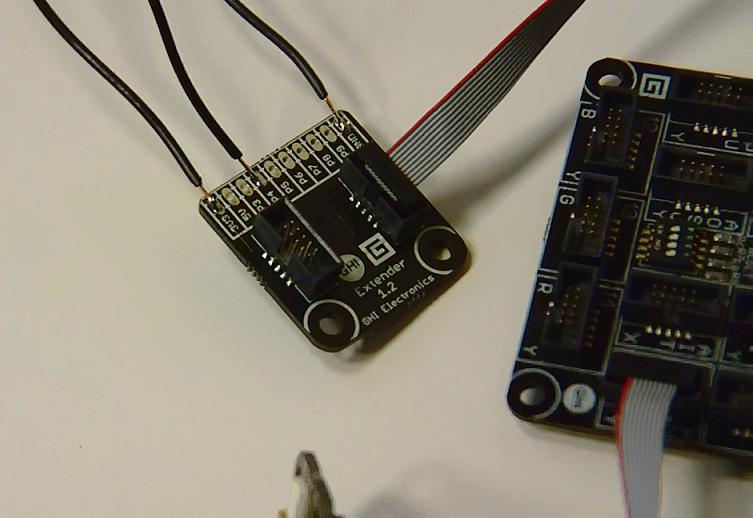 The 3.3 volt input for the module is on pin 1. The ground is on pin 10. The collector side of the phototransistor and the pull-up resistor connect to the 3.3 voltage source on pin 1. The emitter connects to ground. The output connects to the GPIO pin; this example uses pin 4. This module uses the GHI Electronics Extender Module to connect the phototransistor to the mainboard as shown in the following illustration. The hardware driver for this .NET Gadgeteer module is easy to implement using the .NET Gadgeteer Module Template, which can be downloaded from the .NET Gadgeteer CodePlex site. The download package includes other useful builder templates with everything needed to implement drivers for .NET Gadgeteer modules, mainboards, and installation packages for modules and kits. Download and install the templates by using the GadgeteerBuilderTemplates-2.41.301.msi. 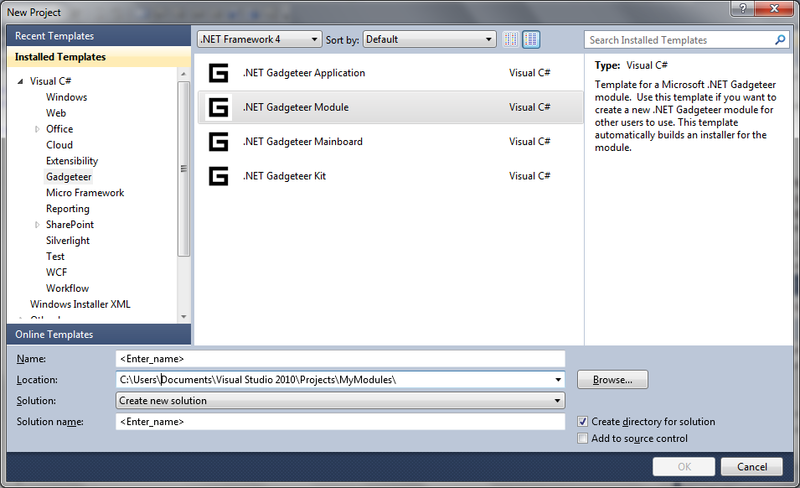 The new Visual Studio project types will include the template options under the Gadgeteer subsection. 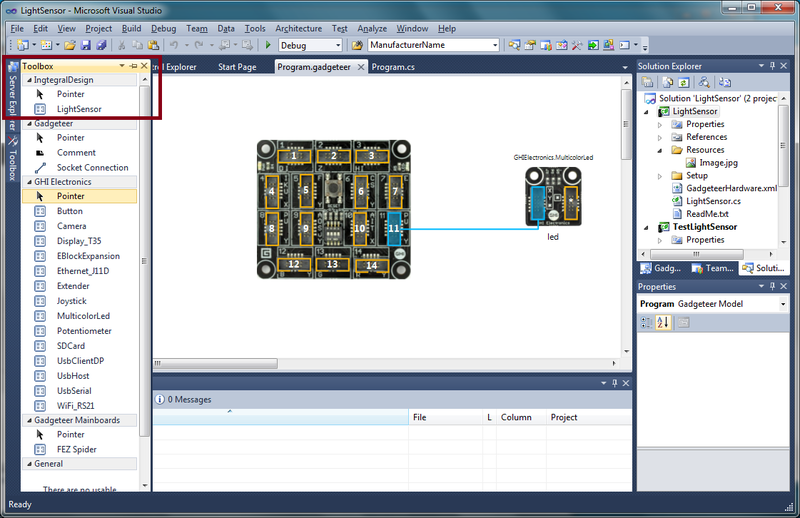 Select .NET Gadgeteer Module. The new project will open to a readme.txt file that describes the driver implementation process. This module requires only a few name changes and the assignment of the output pin and resistor type, pull-up or pull-down. For this module the only changes to the code provided by the template are the output pin assignment and resistor mode in the constructor: GT.Socket.Pin.Four GTI.ResistorMode.PullUp. // Note: A constructor summary is auto-generated by the doc builder. ///socketNumber"&gt;The socket that this module is plugged in to. // This finds the Socket instance from the user-specified socket number. // This will generate user-friendly error messages if the socket is invalid. // GTI namespace provide easy ways to build common modules. // e.g. if the user chooses a socket incompatible with an interrupt input. Follow the first three steps of the instructions in the readme.txt file, build the project, and at step four, you are ready to test the module. Add a test project to the solution of the type demonstrated in other posts in this blog. Add a reference to the new module in the test project. Add a MultiColorLed by using the designer and connect it to socket 11. The light sensor module does not yet have a display image, so you’ll have to instantiate this test module in the Program.cs file rather than by using the Designer. My module uses the name of this blog for ManufacturerName: Gadgeteer.Modules.IntegralDesign.LightSensor. It is declared and instantiated in the following code segments with the Gadgeteer.Modules.GHIElectronics.MulticolorLed that will flash when light activates the sensor. Declare the module as a global entity in the TestLightSensor Program class. Instantiate the module in the ProgramStarted() method. // LightSensor test module initialization. Now that you have instance of the new module, you can use it like any other .NET Gadgeteer module with Intellisense to create event handlers for the input interrupt events that occur when the output goes high and low. The code for this test application is simple. It starts a MulticolorLed blinking red when light activates the sensor and then turns the led off when the light source is extinguished. In this test case, the light is extinguished by covering the sensor, as shown in the video demo at the beginning of this discussion. Build the test application in debug mode and set it as the start-up project of the solution. The elements of the GadgeteerHardware.XML file specify the details of a new module’s implementation, including such things as the manufacturer, UUID, whether the module supplies power to the system, dimensions of the module in millimeters, the minimum version of .NET Gadgeteer Core libraries required, the URL of support information, the assembly that contains the software for the module, and finally socket and pin specifications. The following example shows the GadgeteerHardware.XML file for this LightSensor module after a few small changes were made to the file that the template provided. The module uses socket X or socket Y. It doesn’t have any electrical connection to pin 3, so that pin specification has been commented out: . The module doesn’t use socket type S, so that entire element of the XML is commented out. The module doesn’t require libraries for other mainboards or modules, so that entire section is commented and can be removed. The example below shows the modified file; see the GadgeteerHardware.XML file in a new project for the complete template. This is an example socket specification with two sockets on the board. As described in the readme.txt file, you can replace Image.jpg in the Resources folder of the LightSensor project with an image of the module that will be used by the .NET Gadgeteer Designer. Users will be able to drag and drop the module from the Visual Studio toolbox to the Designer surface, and the image will show the module and enable the Designer to display and connect the module to the right socket on a mainboard. Overwrite Resources\Image.jpg with a good quality top-down image of the module with the socket side facing up, cropped tight (no margin), in the same orientation as the width and height specified in GadgeteerHardware.xml. The Setup folder in the new module project includes everything you need to create an installation package for the new module. A few simple changes to the file Setup\common.wxi will specify parameters for the installer. You don’t have to modify any other file in the Setup directory. The common.wxi file, as shown below, describes the specification very well. The modifications for this LightSensor are similar to previous settings. To build the project in release mode, select Release option from the drop-down menu as shown in the following illustration. Building the project in release mode takes more time than building in Debug mode. The output of release build includes the file LightSensor.msi, which will be found in the $LightSensor\LightSensor\bin\Release\Installer folder. Run this MSI to install the new LightSensor module for use by the .NET Gadgeteer Designer. Create a new .NET Gadgeteer application and add a reference to the LightSensor module, release version, found at $LightSensor\LightSensor\bin\Release\NETMF\GTM.IntegralDesign.LightSensor.dll. Now you should see the module in the Designer Toolbox as shown in the following illustration. Drag the module to the Designer surface, click on the module socket and hold down the mouse button; the sockets that support the X or Y connection will turn green on the Mainboard image as shown in the following illustration. The image for this experimental bread board module is inelegant. Refer to the Module Builder’s Guide for the specifications of production modules. Drag a connection to socket number 4 on the Fez Spider Mainboard as shown below. Save the Designer file in Visual Studio, and close the Designer. To run the test application, use the same code as in the test application, without the declaration and instantiation of the LightSensor, as shown in the following code. The demo should run just as the test application did before building and running the installer. This entry was posted on October 31, 2011, 10:13 PM and is filed under Embedded Microcontrollers. You can follow any responses to this entry through RSS 2.0. You can leave a response, or trackback from your own site.